The revised Boston's Gun Bible is significantly more oriented towards the evaluation (with 63 criteria) and use of 7.62 battle rifles for maintaining American Liberty. Greatly expanded is the coverage of Tactics & Training in Chapter 4, which is now 58 pages. There's much more emphasis on actual range and field shooting with rifles and handguns. You'll find updated gun law info and d ozens of new products and books from SHOT 2002. The handgun chapter has much new good material. And, published for the very first time, are several pages from Boston's upcoming novel, Molon Labe! (which is due in February, 2004).The width and depth of material is unprecedented. Every page is packed with highly useful information not found elsewhere. Boston says that it is a much better book than his original. Leroy Thompson, and many others), the revised Boston's Gun Bible is poised to become the bestselling gun book in recent history. Additional revisions for 2009 includes include Boston's several page analysis of the Heller decision. Boston's Gun Bible is now sold by Brownells, Gunsite Training Academy,Thunder Ranch, Gun Owners of America, the Second Amendment Foundation, Jews for the Preservation of Firearms Ownership, not to mention gun stores and shows across the country. 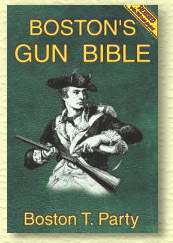 NOTE: The cover of 2002 the revised Boston' Gun Bible has a yellow stripe on the front top right corner, to distinguish it from the 2000 edition. Javelin Press has only the revised edition, although a couple of our smaller distributors may still have the older book (ask them before you order). 33 The Real Goal of "Gun Control"
34 Gun Laws in the 50 States & D.C.
Book arrived today - it is FANTASTIC! Thanks so much. The new book is a fantastic piece of work! The chapter to the Columbine student is worth the price of admission alone. I'm going to order three more in the next week or so as gifts for friends. -- JHI just got your book today. You've really outdone yourself this time. You've covered all the pertinent issues, and then some. I will save you a bit of reading, in case you are in a hurry, and just tell you now to buy this book. If you want to know more before spending $28.00 on improving your shooting, collecting and other gun skills, read on. This book was written by Boston T. Party, the well known (to Libertarians) author of such titles as You and the Police, Surviving Y2K And Other Disasters, Hologram Of Liberty and a handful of other noteworthy titles. If you want yet another glossy photo gun book, extolling all of the imaginary virtues of every firearm ever made, this is NOT the book for you. If you are after a no holds barred consumer guide to firearms, accessories, and shooting, GET IT. Boston's Gun Bible goes into great detail about the pros and cons of various defensive weaponry, equipment, and the philosohy behind their appropriate usage. The work is markedly political, obviously pro gun, and has a rather witty "screw the hoplophobes" tone that I really enjoyed. The writing is crisp and to the point. Eloquent without being boring. This is a hallmark of Boston's work, and you will not be diappointed in Boston's Gun Bible. At about (700) pages, it can't be considered light reading, but the subject matter is important and needs a lot of covering to get it all through to the reader in its entirety. I thought that the project would be rather daunting when he undertook it, but the results are well worth the money. What he ended up with is a layman's guide/how to book for buying, selling, choosing, caring for, KEEPING, shooting and enjoying firearms of all types, but especially those that are "Liberty's Teeth". Especially valuable is the section detailing the merits and faults of various modern semi auto rifle systems. What you will NOT find in this book is ANY hint of advertising $$$ influence, chicanery, or editorial falderal. Boston knows his subject, and covers it exhaustively. The book is available through Javelin Press at http://www.javelinpress.com. Did I mention that you should buy it? I have read a number of your books, and I think you provide valuable information to freedom-lovers, for the most part. However, I must comment on your sexist, misogynist bullsh*t in the Women and Guns section of Boston's Gun Bible. I am a pro-gun female. I believe in the use of deadly force to protect my life and liberties from common criminals and criminal government. Unfortunately, the latter category would include you if you ever got into a position of power. Yes, I might have to shoot you to preserve my liberty. Can we, the pro-gun side, really afford to alienate half the population by reinforcing the stereotype that pro-gun men are sexist Neanderthals who want guns to oppress women? I think not. With that one section in your Gun Bible you have negated the good arguments in the rest of your book. Well! The secret is out! The "T" in my pseudonym stands for "Taliban." You all may be wondering about my response to her, but I did not reply. It has been my long-standing policy, well justified over time, not to reply to anonymous letters sent without a return address. Especially ones as shrill, fatuous and confused as this.